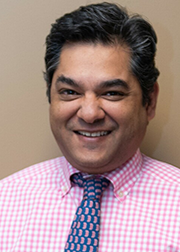 Dr. Mathew completed his undergraduate education at Baylor University in Waco, Texas; his Medical Doctor and Master of Business Administration through Tufts University School of Medicine, Boston, MA. , His internship and residency in Internal Medicine was completed at Madigan Army Medical Center in Ft. Lewis, Washington. Dr. Mathew’s Fellowship in Cardiology was through Walter Reed Army Medical Center in Washington DC., After finishing his Fellowship in Interventional Cardiology at New York Presbyterian Hospital/Columbus University in New York, he served in the military in a variety of Cardiology positions and was deployed to Afghanistan and Iraq. Dr. Mathew then worked at El Paso Heart Center, El Paso, Texas, where he became a Partner. Born in Coventry England, he has earned United States citizenship. He and his wife, Maya, have three children: Sophie, Simone, and William.